In 2010, when Santa Clara voters approved creating a city-run stadium authority to build an NFL stadium to attract the San Francisco 49ers, politicians patted themselves on the back for getting things done and luring a storied franchise 45 miles south to Silicon Valley. The relocation took place before the 2014 season. The contrast with Oakland and its inability to come up with a stadium proposal that would keep the Raiders from eyeing other metro areas was clear. Leaders in the cash-strapped city were unable to prevent the Raiders from committing in 2017 to moving to Las Vegas and working with the Nevada state government on a financing plan that should yield a 65,000-seat stadium for the team to begin using in the 2020 season. 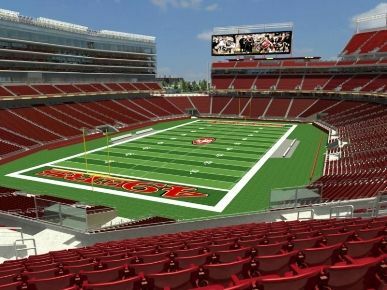 But now the narrative has taken a dramatic shift, and it’s Santa Clara leaders who are facing grief in their community over the 49ers’ arrival in town and the impact of the $1.27 billion Levi’s Stadium (pictured), named after the San Francisco company which paid for marketing rights. What was billed as a win-win situation by team and local officials now looks far more complex. The initial honeymoon has long since given away to a fractious relationship. The biggest annual strain is over how much the team must pay per season. A complex agreement set the 49ers’ rent and operating fees at $24.5 million for the 2017 season. The 2018 assessment was fought over for months before an arbitrator recently said the amount should be set at $24.762 million for the coming season, an increase of just over 1 percent. The ruling contradicted the team’s analysis of baseline rent, stadium operating expenses, debt service and capital reserves. The 49ers argued their total payment should be as little as $16.775 million – a 32 percent cut. The city asked for as much as $25.862 million – a 6 percent increase. There have also been squabbles over the city’s 10 p.m. weeknight curfew for events at the stadium, which has the potential to cause headaches for the team, given the regular season games the NFL holds each week on Monday and Thursday nights, as well as the preseason games that are regularly scheduled on weeknights. Some residents respond by citing quality-of-life issues created by team-related traffic. Both the city and the team share concerns over attendance. While the 68,500-seat stadium regularly sells out on paper, Pro Football Talk and other popular NFL websites took to mocking the 49ers last fall after an October game in which the stadium seemed less than half full, pushing ancillary revenues down. An unexpected problem has been the intense heat seen at Levi’s Stadium for several preseason and regular season games. A five-game winning streak to end the 2017 season raised hopes that attendance will improve going forward. But as Pro Football Talk pointed out, the team and city have reason to be deeply worried about renewals for personal seat licenses, the expensive way that fans can guarantee themselves top seats at games. The license fees are crucial to the revenue model being used to pay off construction and related debt. Many once-successful teams have struggled to sell PSLs after their fortunes took a turn for the worse. Meanwhile, the long-shot hope that the Raiders would continue to have a presence in Northern California after their 2020 move to Las Vegas has been dashed. Nevada media outlets recently reported that the team is likely to move its preseason training camp from its longtime base in Napa to Reno that summer.